Agustí, J. and M. Antón. 2002 Mammoths, Sabertooths, and Hominids: 65 Million Years of Mammalian Evolution in Europe. Columbia University Press, New York. Allard, M. W., R. L. Honeycutt, and M. J. Novacek. 1999. Advances in higher level mammalian relationships. Cladistics 15:213-219. Alroy, J. 1999. The fossil record of North American mammals: evidence for a paleocene evolutionary radiation. Systematic Biology 48:107-118. Archibald, J. D. 2003. Timing and biogeography of the eutherian radiation: fossils and molecules compared. Molecular Phylogenetics and Evolution 28(2):350-359. Arnason, U. J. A. Adegoke, K. Bodin, E. W. Born, Y. B. Esa, A. Gullberg, M. Nilsson, R. V. Short, X. Xu, and A. Janke. 2002. Mammalian mitogenomic relationships and the root of the eutherian tree. Proceedings of the National Academy of Sciences (USA) 99:8151-8156. Asher, R. J., M. J. Novacek, J. H. Geisler. 2003. Relationships of endemic African mammals and their fossil relatives based on morphological and molecular evidence. Journal of Mammalian Evolution 10:131?194. Benton, M. J. 1999. Early origins of modern birds and mammals: molecules vs. morphology. BioEssays 21:1043-1051. Bever, G. S., T. Rowe, E. G. Ekdale, T. E. Macrini, M. W. Colbert, and A. M. Balanoff. 2005. Comment on "Independent origins of middle ear bones in monotremes and therians" (I). Science 309(5740):1492. Bromham, L., M. J. Phillips, and D. Penny. 1999. Growing up with dinosaurs: molecular dates and the mammalian radiation. Trends in Ecology and Evolution 14:113-118. Cifelli, R. L. 1999. Tribosphenic mammal from the North American Early Cretaceous. Nature 401:363-366. Cifelli, R. L. 2001. Early mammal radiations. Journal of Paleontology 75:1214-1226.
de Jong, W. W. 1998. Molecules remodel the mammalian tree. Trends in Ecology and Evolution 13:270-275. Eisenberg, J. F. 1981. The Mammalian Radiations. An Analysis of Trends in Evolution, Adaption, and Behavior. The University of Chicago Press, Chicago. Ginsberg, J. R. 2001. Biodiversity of mammals. Pages 777-810 in Encyclopedia of Biodiversity. Volume 3. S. A. Levin, ed. Academic Press, San Diego, California. Hedges, S. B., P. H. Parker, C. G. Sibley, and S. Kumar. 1996. Continental breakup and the ordinal diversification of birds and mammals. Nature 381:226-229. Helgen, K. M. 2003. Major mammalian clades: a review under consideration of molecular and paleontological evidence. Mammalian Biology 68:1-15. Horovitz, I. and M. R. Sanchez-Villagra. 2003. A morphological analysis of marsupial mammal higher-level phylogenetic relationships. Cladistics 19(3):181-212. Janke, A., O. Magnell, G. Wieczorek, M. Westerman, and U. Arnason. 2002. Phylogenetic analysis of 18S rRNA and the mitochondrial genomes of the wombat, Vombatus ursinus, and the spiny anteater, Tachyglossus aculeatus: increased support for the Marsupionta hypothesis. Journal of Molecular Evolution 54:71?80. Janke, A., X. Xu, and U. Arnason. 1997. The complete mitochondrial genome of the wallaroo (Macropus robustus) and the phylogenetic relationship among Monotremata, Marsupialia, and Eutheria. Proceedings of the National Academy of Sciences (USA) 94:1276-1281. Ji, Q., Z. X. Luo, and S. A. Ji. 1999. A Chinese triconodont mammal and mosaic evolution of the mammalian skeleton. Nature 398:326-330. Ji, Q., Z. X. Luo, C. X. Yuan, J. R. Wible, J. P. Zhang, and J. A. Georgi. 2002. The earliest known eutherian mammal. Nature 416(6883):816-822. Kemp, T. S. 2005. The Origin and Evolution of Mammals. Oxford University Press. Kielan-Jaworowska, Z., R. L. Cifelli, and Z.-X. Luo. 2004. Mammals from the Age of Dinosaurs: Origins, Evolution, and Structure. Columbia University Press. Killian, J. K., T. R. Buckley, N. Stewart, B. L. Munday, and R. L. Jirtle. 2001. Marsupials and eutherians reunited: genetic evidence for the Theria hypothesis of mammalian evolution. Mammalian Genome 12:513-517. Kullberg, M., B. M. Hallström, U. Arnason, and A. Janke. 2008. Phylogenetic analysis of 1.5 Mbp and platypus EST data refute the Marsupionta hypothesis and unequivocally support Monotremata as sister group to Marsupialia/Placentalia. Zoologica Scripta 37(2):115–127. Lin Y.-H., P. A. McLenachan, A. R. Gore, M. J. Phillips, R. Ota, M. D. Hendy, and D. Penny. 2002. Four new mitochondrial genomes and the increased stability of evolutionary trees of mammals from improved taxon sampling. Molecular Biology and Evolution 19(12):2060-2070. Luo, Z. X., P. J. Chen, G. Li, and M. Chen. 2007. A new eutriconodont mammal and evolutionary development in early mammals. Nature 446(7133):288-293. Luo, Z.-X., Q. Ji, J. R. Wible, and C.-X. Yuan. 2003. An Early Cretaceous Tribosphenic Mammal and Metatherian Evolution. Science 302(5652):1934-1940. Macdonald, D. (ed.) 2001. The New Encyclopedia of Mammals. Oxford University Press, Oxford. Mackinnon, J. 2000. New mammals in the 21st century? Annals of the Missouri Botanical Garden 87:63-66. Novacek, M. J. 1992. Mammalian phylogeny–shaking the tree. Nature 356:121-125. Novacek, M. J. 2001. Mammalian phylogeny: Genes and supertrees. Current Biology 11:R573-R575. Nowak, R.M. 1999. Walker's Mammals of the World. Sixth Edition. Volumes I and II. Johns Hopkins University Press, Baltimore. Palma, R. E. and A. E. Spotorno. 1999. Molecular systematics of marsupials based on the rRNA 12S mitochondrial gene: The phylogeny of didelphimorphia and of the living fossil microbiotheriid Dromiciops gliroides Thomas. Molecular Phylogenetics and Evolution 13:525-535. Penny, D. and M. Hasegawa. 1997. The platypus put in its place. Nature 387:549-550. Penny, D., M. Hasegawa, P.J. Waddell, and M. D. Hendy. 1999. Mammalian evolution: Timing and implications from using the LogDeterminant transform for proteins of differing amino acid composition. Systematic Biology 48:76-93. Phillips, M. J. and D. Penny. 2003. The root of the mammalian tree inferred from whole mitochondrial genomes. Molecular Phylogenetics and Evolution 28(2):171-185. Prothero, D. R. 2006. After the Dinosaurs: The Age of Mammals. Indiana University Press, Bloomington. Rauhut, O. W. M., T. Martin, E. Ortiz-Jaureguizar, and P. Puerta. 2002. A jurassic mammal from South America. Nature 416(6877):165-168. Reyes A., C. Gissi, F. Catzeflis, E. Nevo, G. Pesole, and C. Saccone. 2004. Congruent mammalian trees from mitochondrial and nuclear genes using Bayesian methods. Molecular Biology and Evolution 21:397-403. Rich, T. H., T. F. Flannery, P. Trusler, and L. Kool. 2002. 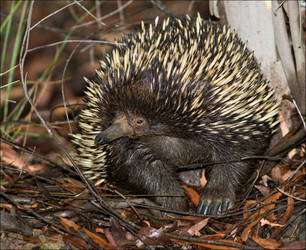 Evidence that monotremes and ausktribosphenids are not sistergroups. Journal of Vertebrate Paleontology 22(2):466-469. Rich, T. H., J. A. Hopson, A. M. Musser, T. F. Flannery, and P. Vickers-Rich. 2005. Independent origins of middle ear bones in monotremes and therians. Science 307:910-914. Rich, T. H., J. A. Hopson, A. M. Musser, T. F. Flannery, and P. Vickers-Rich. 2005. Response to Comments on "Independent Origins of Middle Ear Bones in Monotremes and Therians." Science309(5740):1492. Rich, T. H., P. Vickers-Rich, A. Constantine, T. F. Flannery, L. Kool, and N. van-Klaveren. 1997. A tribosphenic mammal from the Mesozoic of Australia. Science 278:1438-1442. Rose, K. D. 2006. The Beginning of the Age of Mammals. Johns Hopkins University Press, Baltimore. Rougier, G. W., A. M. Forasiepi, and A. G. Martinelli. 2005. Comment on "Independent Origins of Middle Ear Bones in Monotremes and Therians" (II). Science 309(5740):1492. Shoshani, J. and M. C. McKenna. 1998. Higher taxonomic relationships among extant mammals based on morphology, with selected comparisons of results from molecular data. Molecular Phylogenetics and Evolution 9:572-584. Sidor, C. A. 2003. Evolutionary trends and the origin of the mammalian lower jaw. Paleobiology 29(4):605-640. Springer, M. S., A. Burk, J. R. Kavanagh, V. G. Waddell, and M. J. Stanhope. 1997. The interphotoreceptor retinoid binding protein gene in therian mammals: Implications for higher level relationships and evidence for loss of function in the marsupial mole. Proceedings of the National Academy of Sciences (USA) 94:13754-13759. Springer, M. S., M. Westerman, J. R. Kavanagh, A. Burk, M. O. Woodburne, D. J. Kao, and C. Krajewski. 1998. The origin of the Australasian marsupial fauna and the phylogenetic affinities of the enigmatic monito del monte and marsupial mole. Proceedings of the Royal Society of London Series B 265:2381-2386. Szalay, F. S., M. J. Novacek, and M. C. McKenna (eds.) 1993. Mammal Phylogeny. Volume 1. Mesozoic Differentiation, Multituberculates, Monotremes, Early Eutherians, and Marsupials. Springer Verlag, New York. van Rheede, T., T. Bastiaans, D. N. Boone, S. B. Hedges, W. W. de Jong, and O. Madsen. 2006. The platypus is in its place: Nuclear genes and indels confirm the sister group relation of monotremes and therians. Molecular Biology and Evolution 23:587-597. Waddell, P. J., H. Kishino, and R. Ota. 2001. A phylogenetic foundation for comparative mammalian genomics. Genome Informatics Series. Workshop On Genome Informatics Volume 12 :141-154. Wang, Y., W. M. Clemens, Y. Hu, and C. Li. 1998: A probable pseudo-tribosphenic upper molar from the Late Jurassic of China and the early radiation of the Holotheria. Journal of Vertebrate Paleontology 18:777-787. Wilkinson, M. 1999. Choosing and interpreting a tree for the oldest mammal. Journal of Vertebrate Paleontology 19:187-190. Wilson, D. E., and D. M. Reeder, eds. 2005. Mammal Species of the World. Third Edition. Johns Hopkins University Press, Baltimore, MD. Woodburne, M. O., T. H. Rich and M. S. Springer. 2003. The evolution of tribospheny and the antiquity of mammalian clades. Molecular Phylogenetics and Evolution 28(2):360-385. Mammal Tree of Life. A multi-institution collaboration sponsored by the National Science Foundation to build a phylogenetic tree for mammals using data from molecules, anatomy, behavior and physiology of both living and fossil mammals. The Ultimate Mammal Family Tree. Videoclip & transcript from the Australian Broadcasting Corporation's Catalyst programme. Controversial Origins: A Discussion With Olaf Bininda-Emonds and John Wible. GEOTIMES, December 2007. The Life of Mammals. 2002 BBC television series. Division of Mammals. National Museum of Natural History. Smithsonian Institution. Mammal species of the world. Smithsonian Institution. North American Mammals. Smithsonian Institution. The Hall of Mammals. UC Berkeley. Class Mammalia. Animal Diversity Web. University of Michigan Museum of Zoology. MANIS. Mammal Networked Information System. The American Society of Mammalogists. Department of Mammalogy. American Museum of Natural History. University of Alaska Museum Mammal Collection. Arctic, boreal, and North Pacific mammals. The Mammals of Texas. On-line Edition. Animal Info. 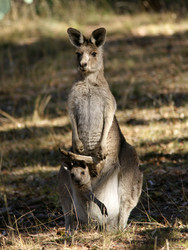 Information on Rare, Threatened and Endangered Mammals. Mammals of Tasmania. Parks and Wildlife Service, Tasmania. Embryo Images Normal and Abnormal Mammalian Development. Comparative Mammalian Brain Collections. University of Wisconsin. Will's Skull Page. Skulls of British mammals & more. Natural History Notebooks: Mammals. Canadian Museum of Nature Online. Amazing Animals. BBC Nature Online: The Really Wild Zone. 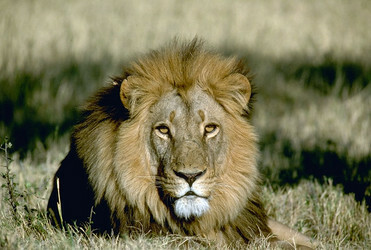 Links to sites focussing on African and European mammals can be found on the Eutheria page. Faunamap. An electronic database for the late Quaternary distribution of mammal species in the United States. North American Fossil Mammal Systematics Database. Phylogenies, taxonomic histories, age-ranges, and body mass estimates for genera and species of Cretaceous and Cenozoic North American fossil mammals. Compiled by John Alroy. World Heritage Australian Fossil Mammal Sites (Riversleigh/Naracoorte). Pleistocene Australian mammals. Discovering a Missing Link. Information about Zhangheotherium quinquescuspidens, a Mesozoic symmetrodont. Carnegie Museum of Natural History. Page: Tree of Life Mammalia. Mammals. The TEXT of this page is licensed under the Creative Commons Attribution-NonCommercial License - Version 3.0. Note that images and other media featured on this page are each governed by their own license, and they may or may not be available for reuse. Click on an image or a media link to access the media data window, which provides the relevant licensing information. For the general terms and conditions of ToL material reuse and redistribution, please see the Tree of Life Copyright Policies.